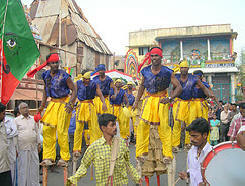 Kakali-kattai is a form of stilt dance prevalent in the North Arcot district of Tamil Nadu. The dance has religious associations since it is traditionally performed during a festival held in honor of Mariamma, the mother goddess. The dance is named after the stilt which is called kokali-kattai. It is about three feet high and is tied to each foot of the dancer. Jingle bells are also tied to each stilt. One has to put in arduous training and practice to become a Kokali-kattai dancer since the dance demands acrobatic skill. held by the dancer with his hands. In Kakali-kattai the stilts are tied to the feet of the dancers and not held at all, which makes it far more difficult. The only musical instrument that provides rhythmic inspiration to the dancers is a large frame drum called Tappettai.